- Darvish Yu Water Fund: the 12th Project Completed! We are approaching the end of 2018. Thanks to your generous support, the Japan Water Forum has undertaken various activities that contribute to the solution of global water issues. Our efforts include a diverse range of activities, such as participating in the 8th World Water Forum in Brazil, assisting grassroots projects in developing countries, and holding the 16th meeting of the Committee for Basic Policy of the Water Security Council of Japan (WSCJ). Talking of diversity, I think of the term bio-diversity. When I first heard this word, it sounded strange to me. I wondered why they used “diversity” in describing the existence of a large number of different kinds of animals and plants. Another word with the same root is “diversion”. This is a particularly important word for me. It has been deeply ingrained in me for more than 40 years. Forty years ago, after finishing university, I made my debut in the working world at the Kawaji Dam site, located deep in the mountains on the Kinugawa River. I was involved in designing the body of the arch dam. At 140 m in height, it was the highest dam at that time to be built by the Ministry of Construction. I also engaged in geological investigation at the foundations of the dam. At the time, a diversion project was underway at the construction site. The construction of a dam is accomplished by stopping the flow of water in the river. We cannot pour concrete when the river is flowing. 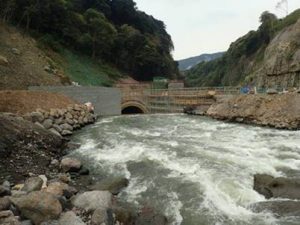 Therefore, what we have to do first is bore a tunnel that will divert the water from the upper reaches of the river, leaving the dam construction site dry. Then we can pour the concrete. This tunnel is called a “diversion tunnel”. Almost every day, I examined the rock at the entrance of the diversion tunnel. Even after the diversion work had started, I went around the tunnel, repeatedly hitting the rock with a hammer. The tunnel was a perfect place for investigating rock. My career as a civil engineer began at this site. Is a Variety of Differences Diversity? At the dam construction site, I learned about the concept of diverging a river’s flow through an English term: diversion. Later, I was involved in the construction of the Ookawa and Miyagase dams. In the course of time, the term “diversion tunnel” has become “temporary drainage tunnel”. But I couldn’t get the term “diversion” out of my head. Therefore, when I first saw the word, bio-diversity, I was confused as to how diverting water is connected to a word meaning a variety of differences. When I looked up the verb, “divert” in my English‐Japanese dictionary, it said that the word means to make something or somebody change direction or diverge. My understanding of the word was right. 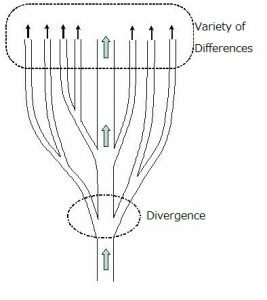 The term, diversity has a connection to diverting or branching off. How diverting flow is connected to a word “tayousei” in Japanese? While I was pondering this, I drew a rough sketch which helped me find the answer to my question. Figure 1 shows the diversion of a dam. The photo shows the entrance of the diversion. Figure 2 shows how a river repeatedly branches off from the main stream. When the river repeatedly diverges, it gradually creates different flows. The Japanese term, tayousei, describes the result after the river has diverged. In contrast, the English word, diversity describes the moment of divergence. 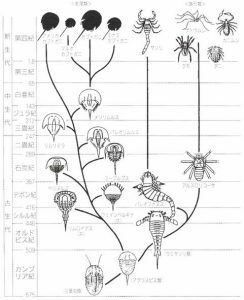 This figure resembles a systematic diagram of the evolution of organisms. As a species diverges, it evolves. Figure 3 is a systematic diagram of evolution. If a species diverges, it acquires diversity. As long as organisms maintain diversity, they can withstand drastic changes in the environment and can survive. Reference: Washiya Idumi and Yhara Tetsukazu (1996). Hozen Seitigaku Nyuumon (Introduction to conservation ecology), Tokyo, Bun-ichi Co. Ltd. The opposite of diverge is converge. Convergence brings uniformity. A uniform species could not withstand drastic changes in the environment. The whole species would collapse. If evolution means diversity, uniformity means degeneration. Organisms survive by diversifying. Diversity is a strategy for organisms, including humans, to survive. The Japan Water Forum is determined to launch a diverse range of activities for the resolution of water environment issues. The privilege of an NPO is to address new challenges without fear of failure. While meeting these challenges, we are sure to find new roads that will lead to a new world. This is a principle of evolution. In the coming New Year, we at the JWF will do our best to address new challenges based on our experience and past achievements. Darvish Yu Water Fund: the 12th Project completed! As the 12th project, we have carried out the activities for providing safe and clean drinking water in Khyber Pakhtunkhwa province, Pakistan through installing hand pumps. As a result of this project, 52 households have gained the access to safe and clean drinking water.